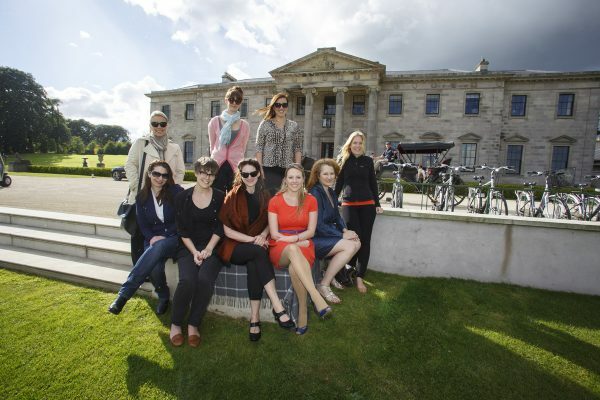 Seven leading Australian travel writers visited Laois recently, as guests of Tourism Ireland. Representing a news agency and various publications (like The West Australian newspaper and Australian Traveller magazine), with a combined reach of over 3.5 million people – or potential Australian holidaymakers – the journalists were here to experience at first-hand some of the many things to see and do here, for feature stories they are planning to write about holidays in this part of Ireland. Australian journalists at Ballyfin Demesne, Co Laois, including (seated, l-r) Tanya Joslin, Holidays for Couples (magazine); Gemma Nisbet, The West Australian (newspaper); Helen O’ Neill, The Sun-Herald (newspaper) and Get Up & Go (magazine); Donna Campbell, Tourism Ireland; Cleo Glyde, Sunday Style (Travel Bug section); and (standing, l-r) Astrid Mulholland Licht, Austria Tourism; Jennifer Pinkerton, The Australian Traveller (magazine); Melanie Milne-Davies, Australian Financial Review (Sophisticated Traveller section); and Jennifer Ennion, Australian Associated Press. One of the highlights of the group’s itinerary, designed by Failte Ireland, was a guided tour of Ballyfin House – with the writers visiting the costume department there and trying on period costumes to wear to their special ‘Downton Abbey’ style dinner. The group also overnighted at Ballyfin Demesne. 2012 was a record year for visitor numbers from Ireland’s long-haul markets. And indications for 2013 are also positive; with Etihad’s increase of +35% in capacity on its service from Abu Dhabi to Dublin this year, which is in addition to the Emirates service from Dubai, the island of Ireland is more accessible than ever before for visitors from long-haul markets like Australia.